Here's a variation of Discrete Peaceful Encampments: Player 3 has entered the game! (which itself is a variation of Peaceful Encampments). You have 3 white queens, 3 black queens, 3 red queens, and 3 green queens. 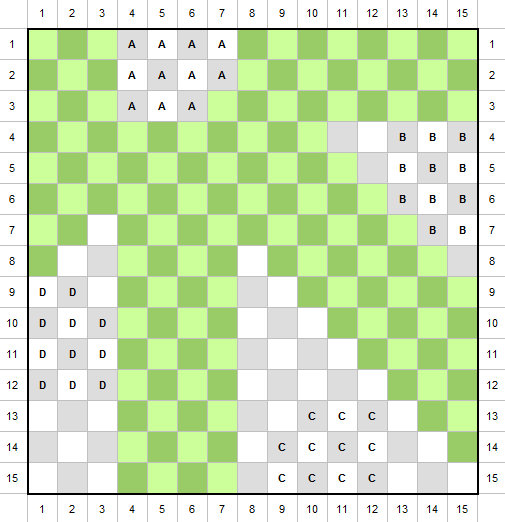 Place all these pieces onto a normal 8x8 chessboard in such a way that no queen threatens a queen of a different color. 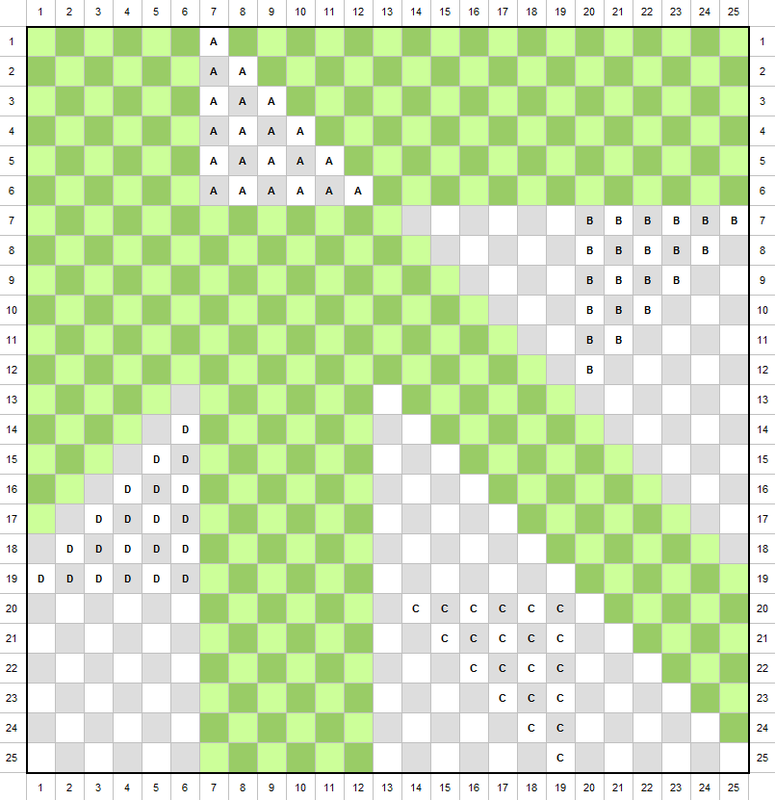 Place 5 queens of each of four different colors onto a 10x10 checkerboard so that no queen threatens a queen of a different color. 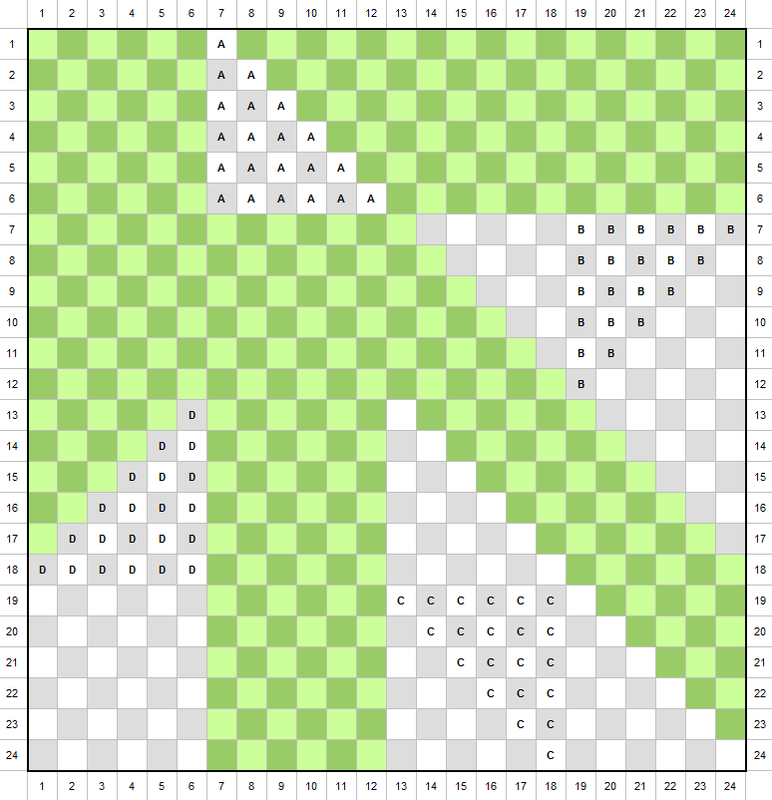 Place 7 queens of each of four different colors onto a 12x12 checkerboard so that no queen threatens a queen of a different color. 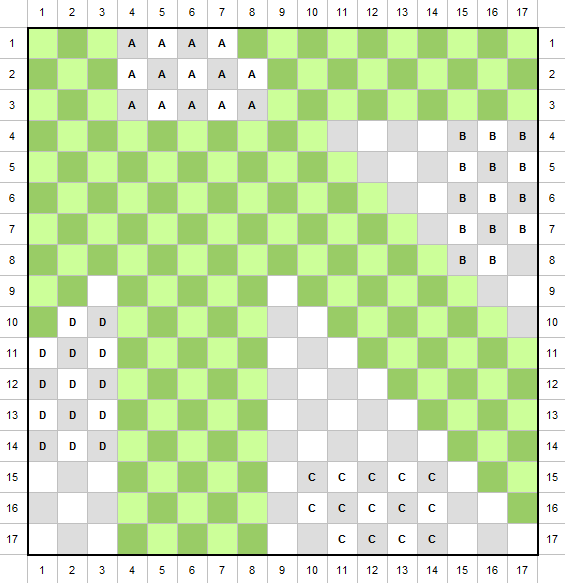 At what point does it become possible to place more than $N-5$ queens of each of four different colors peacefully onto an $N\times N$ checkerboard? it follows that we can build a symmetric solution where each army occupies a right-isosceles-triangle of side $6$. so rotating a quarter or half-turn, other armies are just like A. 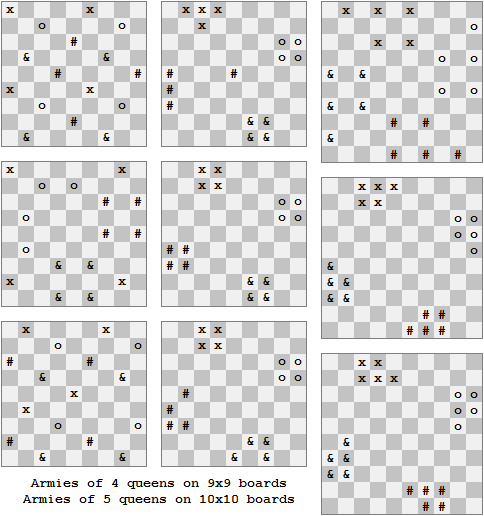 There exists no solution for $4$ armies of $9$ queens each on a $13\times13$ board, so Jonathan's $10$ on $14$ is the first with armies of $N-4$ queens. 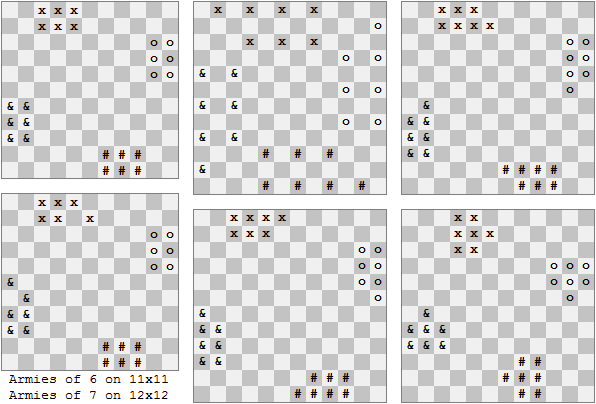 These are the only solutions for armies of $6$ queens on an $11\times11$ board. For the $12\times12$ and larger boards, the search was modified to find only rotationally symmetrical solutions. These solutions can be easily expanded to ever larger boards, with armies of $18$ queens on a $19\times19$ board and armies of $20$ queens on a $20\times20$ board. 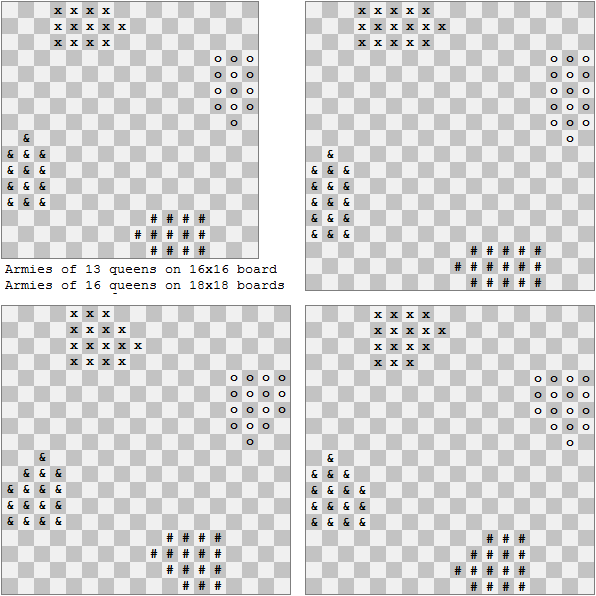 The claim that these are optimal is based on the fact that there were no centrally located queens in any solution on $10\times10$ or $11\times11$ boards. This suggests that your general solution for $4$ armies is itself optimal. 12 is the lower bound. Whether 12 or 13 works is yet to be seen. Not the answer you're looking for? 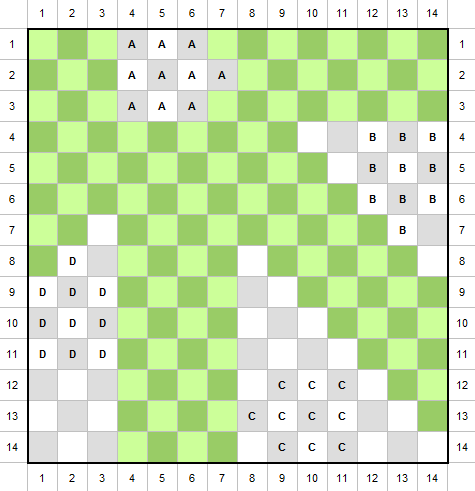 Browse other questions tagged mathematics geometry chess checkerboard or ask your own question.